Fig 1. 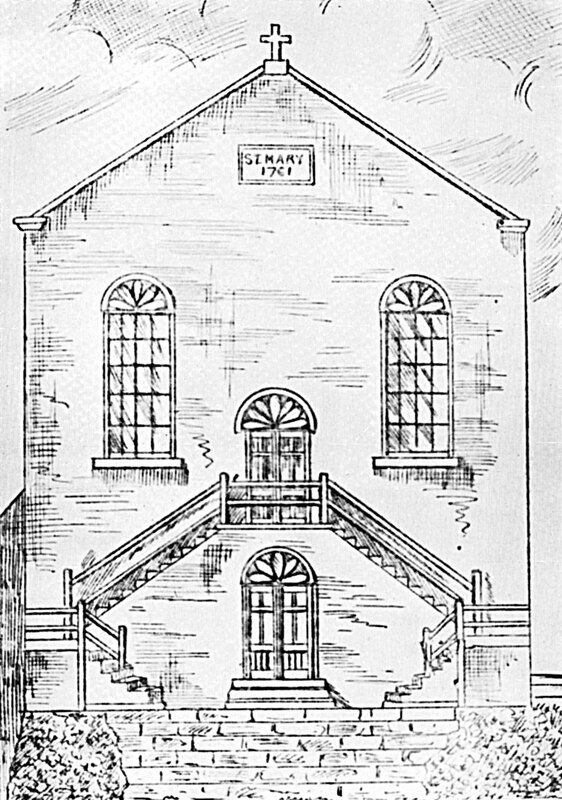 The Rev P. Cronin’s sketch of Friargate’s 1605 ‘chapel’. Fig 2. 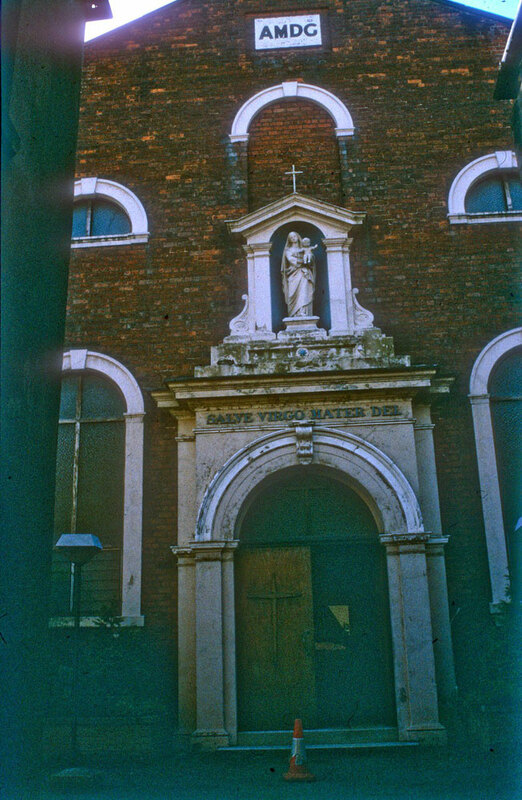 Beth Hayes captured this photograph of the rather tired looking front of St Mary’s Chapel on Friargate in 1990, shortly before its demolition. 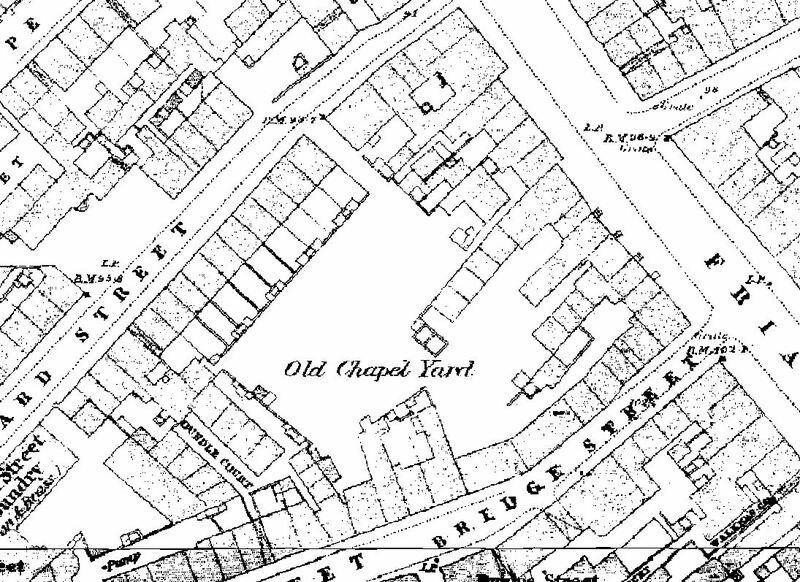 An earlier chapel occupied a site lower down Friargate in the early 18th century and claims are made for a chapel on that site as early as 1605. Image courtesy of Preston Historical Society. Neither writer supplies any evidence for their assertions (it is probable that Hewitson simply plagiarised Hardwick), and whatever was the source of their inspiration will most likely never be known: no other mention of the 1605 chapel has been found. Leo Warren begins his Through Twenty Preston Guilds with an introduction to Catholicism in post-Reformation Preston and notes the Bishop of Chester’s 1605 visitation but does not even mention Hewitson’s chapel. 1605 was also the year of the Gunpowder Plot, surely an inauspicious time to be opening a Catholic chapel in a town with a strong Puritan presence? Fig 4. 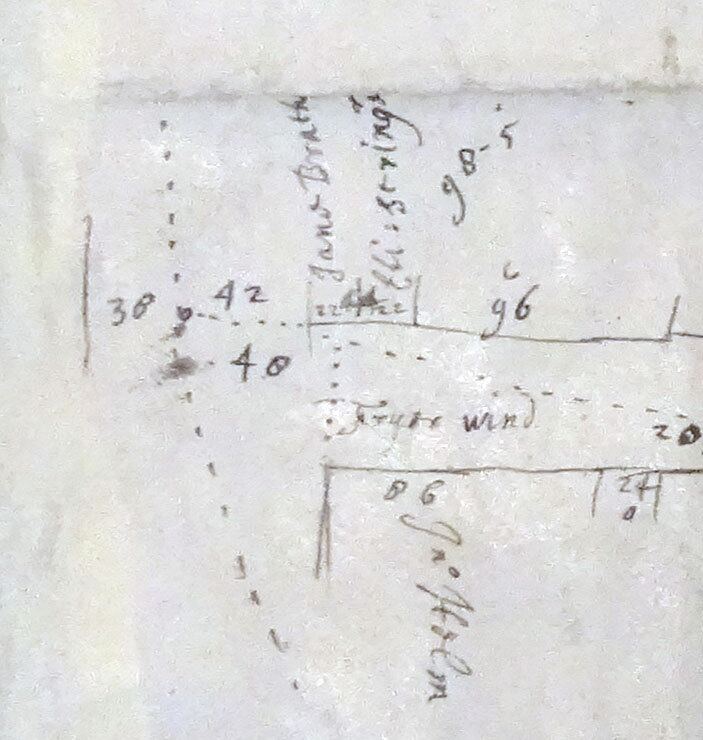 A section of one of the sketch plans drawn by the 1685 surveyors on which the above reconstruction is based. The junction of Fryer Lane (present Marsh Lane) with Friargate and the Friargate barrs are shown. (DDX194/7 Reproduced with permission of Lancashire Archives). Fig 5. A section of another of the sketch plans. The junction of Fryre Wind (alternative name for the present Marsh Lane) with Friargate is shown. (DDX194/19 Reproduced with permission of Lancashire Archives). 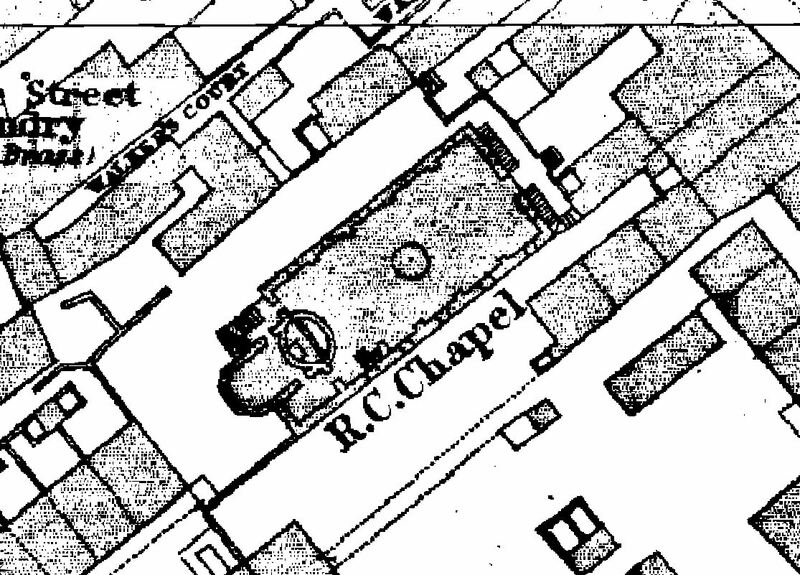 There was no mention of the chapel by the surveyors who produced a detailed plan of the town in 1685, the relevant section of a reconstruction of which is shown above. 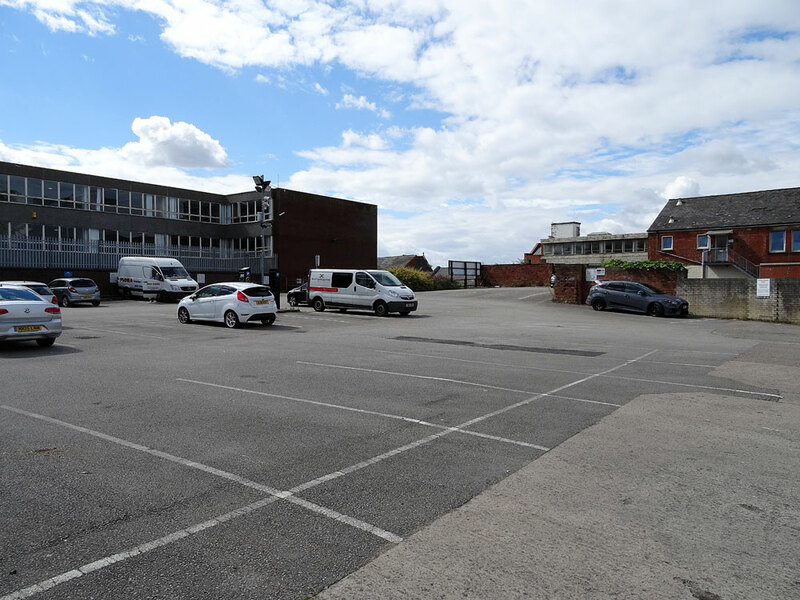 It is unlikely they would not have noted a Catholic chapel in the town yet there is no sign of a building in the empty space behind the corner of Friargate and Fryre wind (the present Marsh Lane) in their sketch plans. Firmer evidence for a Preston chapel comes two years later, during the brief period of Catholic ascendancy that James II introduced and which flickered and died between 1687 and 1688. In Lancashire this ascendancy was heralded by Molyneux’s appointment as lord lieutenant in 1687. It was he who leased the Fishwick Hall estate to the Benedictines, who established a chapel there at this time. The difficulty is that Warren simply gives his source as ‘in the Westminster Cathedral Archives’ (he was writing before the Visitation transcription was published). Also, his figures do not tally with those in the transcription. Would the Visitation transcribers have missed Smith’s Jesuit connection, for which neither of his quoted sources supply evidence? We are led to believe that at this time the Catholics at Preston were but few, because we do not find that any stir was made during the short sunshine of the reign of James II, as occurred in other places ­ – Wigan, for example where we read that we had opened a flourishing college, with one hundred scholars; that the foundations of a new college and chapel had been laid, the old chapel being too small for the multitudes that flocked to the sermons, at which the Governor of the town and his attendants used to frequent. It was during Foley’s ‘short sunshine’ that Leyburn had been made bishop by Pope Innocent XI in 1685 at James’s request. He returned to England from Rome shortly afterwards as vicar apostolic. Despite this interest and favour shown by James, Leyburn shared the pope’s distrust of the Jesuits generally, and especially those who surrounded the king and were his advisors urging him to foster a Gallican Catholicism. It could be said that Leyburn and the Jesuits detested and distrusted each other. What would Leyburn have made of Jesuits establishing a mission in Preston? Mr. Rishton gave an account of the quaker. His name is Scansfield. He pretends to be a docter – a dangerous, seditious fellow, and not without some suspicion of being a Jesuit. All his relations are R. C. He sayd there was a plott discovered of ye Bpps Keeping confederacy with Holland for raysing disturbances in England. He pretended to have an interest att Court, and to have an interest in electing Burgesses for this corporation. He and Tompson the Regulator were much together. Given such deep suspicion of the agents James attempted to insinuate in the town and the concern that one of them might be a Jesuit, it seems unlikely that the Jesuits would have so publicly advertised their presence as to open a chapel in one of the main streets of Preston. If they had it is unlikely that it would have escaped the notice of Bellingham or of his fellow diarist, Lawrence Rawstorne. Yet there is no mention of a Jesuit chapel in either diary, and the only suspicion of the presence of a Jesuit in the town comes in Bellingham’s reference to Scanfield. What Lawrence Rawstorne does recount is his detention and committal to Lancaster of a Catholic priest, Christopher Tootell, on 28 May 1689. Fr Tootell was the priest who took charge of the mission at Ladywell, Fernyhalgh, in 1699, at the same time being appointed rural dean of Amounderness and later, grand-vicar for Lancashire, Cheshire, Cumberland and Westmorland. On the same day in May that Tootell was apprehended, Bellingham reports dragoons going out in the evening ‘to search for Papists’ armes’. It is hardly likely Jesuit priests would have been allowed to officiate at a chapel in Preston at this time. The Bellingham and Rawstorne diaries from the end of 1688 through 1689 detail the constant arrival of Protestant gentry fleeing Ireland with tales of their ill treatment at the hands of Catholics. The diaries also describe the arrival and temporary accommodation in Preston of regiments on their way to Ireland to relieve the besieged Protestants in Derry. It was clearly not a propitious time to be a Catholic in Preston. So many troops in the town occasioned much heavy drinking and unruly behaviour as both diarists record, while they themselves happily joined in the officers’ tours of the town’s taverns. William III was clearly concerned about the condition of his regiments in the north, especially as many of the soldiers had previously pledged loyalty to James II. He sent three commissioners to Lancashire in 1689 to investigate and they were in Preston for two days (Bellingham/Rawstorne diaries 20 and 21 June). Two of the commissioners were among the seven noblemen who had originally invited William to invade. The third was Thomas Wharton, a man who was clearly no respecter of Anglican church property: a few years previously he had been fined £1,000 for sacrilege: ‘In a state of intoxication he and his brother Henry forced the doors of the parish church of Great Barrington in the middle of the night, rang the bells, tore up the Bible, and “pissed against a communion table”.’  He and his like would be even less respectful of Catholic property and persons. What is clear from this letter is that if Peploe complained about a public chapel at Fernyhalgh he would not have overlooked a chapel on one of Preston’s main thoroughfares. It does seem that Catholic worship in Preston at this time was a private affair, practised in the homes of local Catholics and possibly in ‘the tenement at the lower end of Friargate’. He is wrong in locating the White Bull in New Street. It was the inn that later became the Bull and Royal, which was in Church Street or Church-gate as the context of the above quotation makes clear. Richard Jackson was landlord of the White Bull from at least 1685. New Street was not opened until early in the next century, and would not have been described as near the church, it was on the north side of the Market Square. There was a White Bull there but it was a much smaller and less prestigious establishment than its Church Street namesake. Peploe’s letter suggests it was unlikely there was a public Catholic chapel in Preston in 1714, but one had been established by 1732 as the Poor Tax Book makes clear. In a draft of a reply dated 19 February 1726-7 on the back of a letter from Mr J. Wilkinson, of Wrightington, Christopher Tootell speaks of addressing ‘a considerable congregation of the Catholic inhabitants of the Town’. Could this have been in the Friargate chapel? Warren provides an account of the way in which the site of the future St Mary’s Chapel at 62 Friargate was acquired and secured. He traces the property, known as ‘Greystocks Houses’, back to a deed of 1713. Between then and 1761 when St Mary’s Chapel was built the property passed through several ‘owners’, in order, as Warren notes, to secure it in Catholic hands. In 1742, the lawyer handling the transactions confessed that the work caused him ‘a great deal of trouble’. … formerly consisting of two Dwellings with out-housing and Garden … on the South side of the Fryergate Barrs in Preston … with a large edifice or building largely erected in the Garden thereof sometimes called the Chapel which was formerly the estate of George Graystock, late of Preston, deceased, and since in the possession of Mrs A Sandford, widow. A lease for one hundred years, dated May 10, 1759, was granted to Thomas Clifton, Esq., of Lytham, our friend, of ‘a certain piece of ground , being part of a garden belonging to a dwelling house, on the south side of the Friargate, near the Barrs, then in the possession of Mr. Barnewell (Father Barnewell), as the same was then marked out, in order to erect a new building thereon. 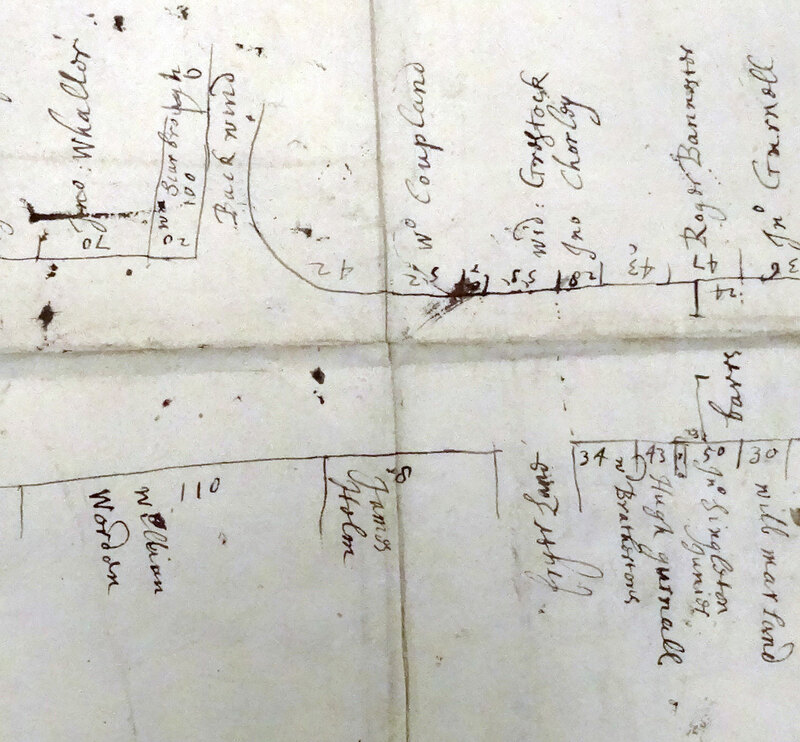 From the above records of property transactions it would appear that the Jesuits bought the property on Friargate in 1733, behind which St Mary’s was later built, their hold on the site being concealed by assigning the lease to friendly laymen. The house fronting onto Friargate would seem to have been lived in by Fr Barnewall and the garden behind the house was marked out as the site of St Mary’s in 1759. It is a chapel of ease for St. Wilfrid’s, and is attended to a very large extent by Irish people. The situation of it is lofty; it stands upon higher ground than any other place of worship in the town; but it is so hemmed in with houses, &c., that you can scarcely see it, and if you could get a full view of it nothing very beautiful would be observed about the exterior. The locality in which this chapel is placed is crowded, dark-looking, and pretty ungodly. All kinds of sinister-looking alleys, narrow yards, dirty courts, and smoky back streets surround it; much drinking is done in each; and a chorus of noise from lounging men in their shirt sleeves, draggle-tailed women without bonnets, and weird little youngsters, given up entirely to dirt, treacle, and rags, is constantly kept up in them. The chapel has a quaint, narrow, awkward entrance. You pass a gateway, then mount a step, then go on a yard or two and encounter four steps, then breathe a little, then get into a somewhat sombre lobby two and a half yards wide, and inconveniently steep, next cross a little stone gutter, and finally reach a cimmerian square [?! ], surrounded by high walls, cracked house ends, and other objects similarly interesting. The front of the chapel is cold-looking and devoid of ornament. Upon the roof there is a square perforated belfry, containing one bell. It was put up a few years ago, and before it got into use there was considerable newspaper discussion as to the inconvenience it would cause in the morning, for having to be rung at the unearthly hour of six it was calculated that much balmy quietude would be missed through it. Some people can stand much sleep after six, and on their account early bell-ringing was dreaded. But the inhabitants have got used to the resonant metal, and those who have time sleep on very excellently during its most active periods. Large congregations attend this chapel, and the bulk, as already intimated, are of the Milesian order [by which he means Irish]. At the rear, where many of the poor choose to sit, some of the truest specimens of the “finest pisantry,” some of the choicest and most aromatic Hibernians we have seen, are located. The old swallow-tailed Donnybrook Fair coat, the cutty knee-breeches, the short pipe in the waistcoat pocket, the open shirt collar, the ancient family cloak with its broad shoulder lapelle, the thick dun-coloured shawl in which many a young Patrick has been huddled up, are all visible. The elderly women have a peculiar fondness for large bonnets, decorated in front with huge borders running all round the face like frilled night-caps. The whole of the worshippers at the lower end seem a pre-eminently devotional lot. How they are at home we can’t tell; but from the moment they enter the chapel and touch the holy water stoops, which somehow persist in retaining a good thick dark sediment at the bottom, to the time they walk out, the utmost earnestness prevails amongst them. Some of the poorer and more elderly persons who sit near the door are marvellous hands at dipping, sacred manipulation, and pious prostration. Like the Islams, they go down on all fours at certain periods, and seem to relish the business, which, after all, must be tiring, remarkably well. He does allow that ‘Considering its general character, the congregation is very orderly, and we believe of a generous turn of mind’. That demolition marked the end of a long period of public Catholic worship in Friargate stretching back to the early 18th century, and possibly into the 17th century, although this is unlikely. The period from the opening of St Mary’s Chapel in 1761 to its final closure is well documented, an earlier chapel on a different site in the street dating from before 1732 is also documented. More problematic are earlier ‘chapels’. Peploe’s correspondence makes it fairly clear there was no Catholic chapel in the town in 1714 and the evidence supplied by Leo Warren and Tom Smith for a Catholic chapel in Friargate served by Jesuits seems rather to point to the Benedictine chapel at Fishwick. 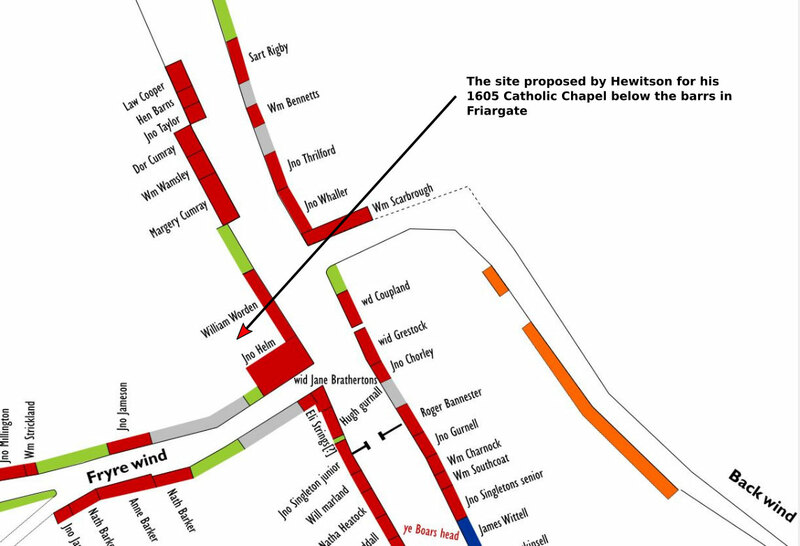 Even more problematic is Hardwick’s and Hewitson’s thatched chapel of 1605. Warren simply ignores it, David Hunt is very sceptical and Fr Blundell and Smith urge caution. Only John Hilton is uncritically accepting of the existence of the chapel, citing Blundell as his source, who follows Hewitson, yet ignoring Blundell’s circumspection. 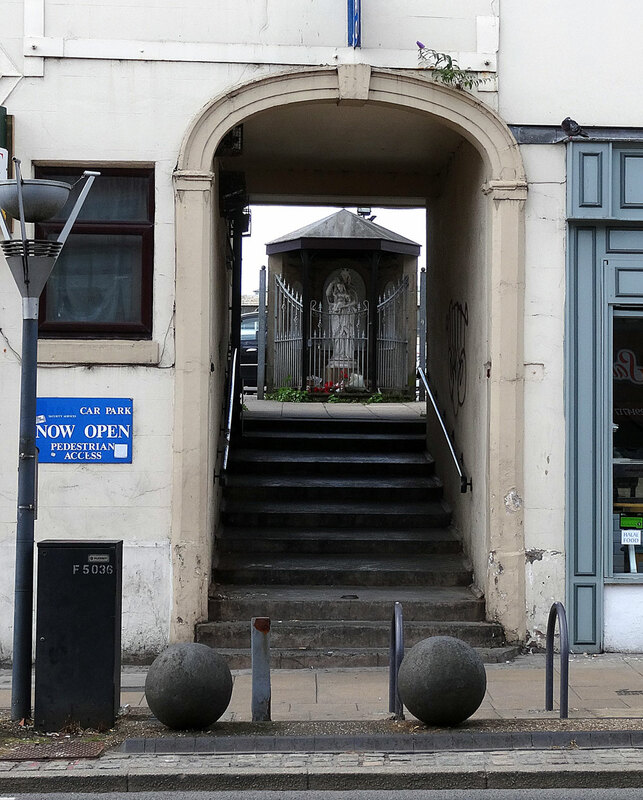 Hilton describes it as a ‘secret’ chapel but it is highly unlikely that a place of Catholic public worship in the centre of Preston would have remained secret for long. No source other than Hewitson, plagiarising Hardwick, has been found and a careful study of his editing of the town’s court leet records  and the Bellingham and Rawstorne diaries show him to be an extremely untrustworthy witness. F. O. Blundell, Old Catholic Lancashire, vol. 2 (Burns, Oates & Washbourne, 1938), facing p. 130. Charles Hardwick, History of the Borough of Preston and Its Environs, in the County of Lancashire (Preston: Worthing, 1857), 478. Anthony Hewitson, Our Churches and Chapels, Their Parsons, Priests & Congregations (Preston: Chronicle (Printer), 1869), 182. Anthony Hewitson, History of Preston, reprint of 1883 edition (Wakefield: S. R. Publishers, 1969), 501. John A. Hilton, ‘The Post-Reformation Catholic Community in the North of England’ (PhD, Manchester Metropolitan University, 2016), 212, e-space.mmu.ac.uk/615950/1/HiltonthesisRevised.pdf. J. A. Hilton, Catholic Lancashire: From Reformation to Renewal, 1559-1991 (Philimore, 1994), 30. Blundell, Old Catholic Lancashire, 2:137. Tom Smith, Catholics in Preston: From Early to Modern Times (Wigan: North West Catholic History Society, 2008), 42. Leo Warren, Through Twenty Preston Guilds: The Catholic Congregation of St Wilfrid’s, Preston (Preston: AMA Graphics [for] St Wilfrid’s, Preston, 1993), 13. David Hunt, A History of Preston, 2nd ed. (Lancaster: Carnegie, 2009), 64. Smith, Catholics in Preston, 57. J. A. Hilton et al., eds., Bishop Leyburn’s Confirmation Register of 1687 (Wigan: North West Catholic History Soc, 1997), 117–32; Warren, Through Twenty Preston Guilds, 14. Hilton et al., Bishop Leyburn’s Confirmation Register of 1687, 305. Warren, Through Twenty Preston Guilds, 14. H. F. [Henry Foley], ‘The Preston Mission S.J.’, Letters and Notices 10 (June 1875): 315–36. John Lingard, A History of England, 3rd ed., vol. 14 (London: Baldwin and Cradock, 1831), 103; Steve Pincus, 1688: The First Modern Revolution (Yale University, 2009), 141–42, 191, 210-11,. Pincus, 1688: The First Modern Revolution, 157. ‘The Defection of John Scanfield’, The Journal of the Friends’ Historical Society 5, no. 4 (1908): 177–87. Smith, Catholics in Preston, 58. Clifford Walton, History of the British Standing Army. A.D. 1660 to 1700 (London: Harrison and Sons, 1894), 80, http://archive.org/details/historybritishs00waltgoog. Colin Haydon, Anti-Catholicism in Eighteenth-Century England, C. 1714-80: A Political and Social Study (Manchester University Press, 1993), 66–67. Colin Haydon, ‘Samuel Peploe and Catholicism in Preston, 1714’, Recusant History 20, no. 1 (1990): 78–79. Warren, Through Twenty Preston Guilds, 18. James F. Splaine, History of the First Catholic Charitable Society (Preston: Buller (Printer), 1895), 8. ‘Regulation of Poor Tax Book’, 1732, property ref: 206, CNP/3/1/11, Lancashire Archives. B. C. Foley, Some Other People of the Penal Times (Preston: Snape (Printer), 1992), 98. Warren, Through Twenty Preston Guilds, 18–19. Henry Foley, Records of the English Province of the Society of Jesus, vol. 7, Part 1 (London: Burns and Oates, 1882), 448. ‘Regulation of Poor Tax Book’, property ref 251. Blundell, Old Catholic Lancashire, 2:facing p. 132. Smith, Catholics in Preston, 72, 79. Anthony. Hewitson, Our Country Churches and Chapels: Antiquarian, Historical, Ecclesiastical and Critical Sketches (Preston: Hewitson, 1872), 181–86. Anthony Hewitson, Preston Court Leet Records: Extracts and Notes (Preston: George Toulmin & Sons, 1905).